Thank you Birmingham District Voters! On behalf of everyone that worked hard to support the citizens committee and Friends of BPS campaign to renew the Birmingham School millage – THANK YOU! The community support was overwhelming with a Yes vote total of 76.22% With the districts commitment to excellence in education, and the community expectations of highest standards, the nine communities served by BPS will continue to move forward for all students. Welcome to the Friends of BPS citizens web page. We are supporters of the Birmingham Public School District and we work to help ensure the funding needs of the district are meet. Please explore this site and learn about the district and how public schools are financed. 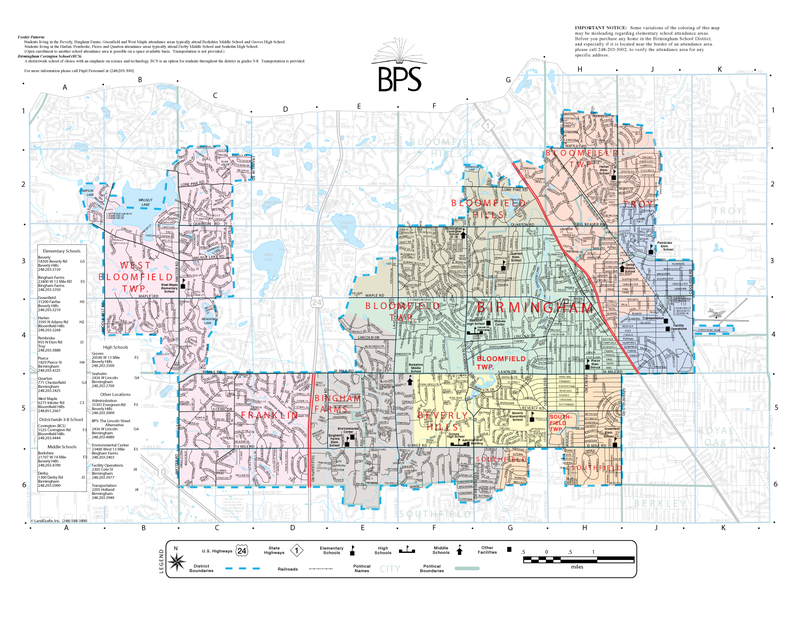 You can find all the municipalities that are covered by the BPS district, and what a millage renewal means to you as a homeowner. Join our mailing list to stay informed. Thank you! Zero rate increase. All schools in Michigan are funded with local and state millages, BPS is grateful for the continued support of the hold harmless millage which represents an additional $3,877.23 per full time student (it’s been the same per student amount since 1994). Strong schools support strong communities, thank you for your interest and support. The residents of the Birmingham School district have always know the power of supporting great schools. This renewal ensures we continue to fund our schools in a manner that protects smaller class sizes and diversity of programing. There are nine communities that comprise the Birmingham Public School District. It is only through your continued support that we can fulfill the mission and the objectives of the new strategic plan. Click on map to see your community. Remember to take down the yard signs! As cool as they were, it’s time to take down the yard signs. Recycle the paper component of the sign. To recycle the metal part of the sign the wire must be cut into smaller parts to fit into recycling bins. 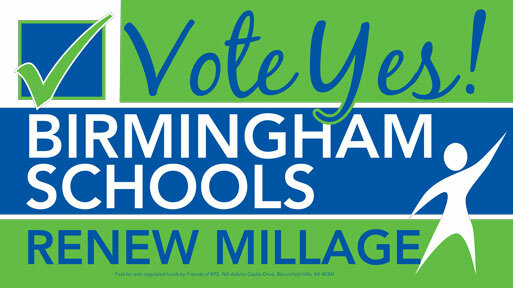 On November 8, 2016 voters in the Birmingham Public School District were asked to renew the existing operating millage. With this approval the millage is extended by 5 years and WILL NOT increase any taxes. The panels below summarize the most frequently asked questions (click panel to open individually). All Michigan school district operations are funded through a mixture of local and state millages. This renewal was one part of those millages and will have ZERO increase on individual or business millage rates. What About the Recent Bond? The Bond, which passed with a 68% percent approval rate, addressed the physical infrastructure needs of the district. This included improvements to safety entrances, upgrades to computer and communications networks, boiler replacements and numerous other “physical asset” improvements. None of the bond funds can or will be used to fund operations as prescribed by state law. The millage funds the day to day operations of the district and includes costs for teachers, programs, and curriculum materials. By electing to secure the millage in November, the district was able to add the measure to the General Election ballot cycle and save the costs associated with a regular or special school election process at a different date. What are the benefits for residents without children? According to realtor statistics, the quality of a school district’s programs and the condition of its facilities are two factors that people consider when choosing where to purchase a home. Realtors in the District’s communities agree that people are drawn to the Birmingham area because of the strong academic foundation our schools offer. The District continues to provide a rigorous academic experience along with a focus on character education and service learning as noted in our Strategic Plan. Renewing the existing millage rate ensures continued preservation of smaller class sizes and excellence in programming. Additionally, our school facilities and sites are regularly used by community members for recreational/athletic opportunities and events, meetings, performances, and senior citizen activities. Although this video was made for the bond, the point linking home values and school performance remains valid. Thank you for your support. With your help the millage passed with a 76.22% rate!